Huh, apparently at some time after this article was published an extra ‘e’ was added to employee because in this article it’s all employes and employe. FIRES, floods, earthquakes, tornadoesâ€” these are some of the hazards that bring drama into the work of telephone employes. Keeping communication lines open during disasters is a vital matter. As long as nature behaves herself, as long as things go along normally, the work of the lineman, the operator, and the man on the test board is routine, but when trouble begins heroes are made. 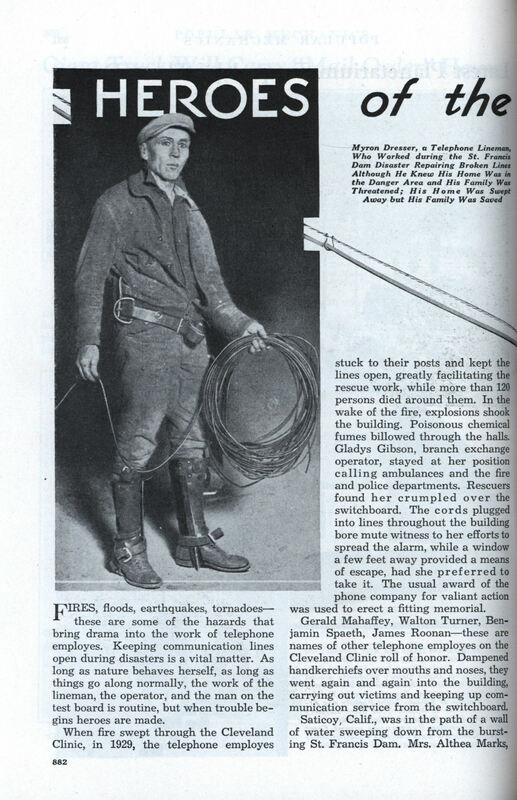 When fire swept through the Cleveland Clinic, in 1929, the telephone employes stuck to their posts and kept the lines open, greatly facilitating the rescue work, while more than 120 persons died around them. In the wake of the fire, explosions shook the building. Poisonous chemical fumes billowed through the halls. Gladys Gibson, branch exchange operator, stayed at her position calling ambulances and the fire and police departments. Rescuers found her crumpled over the switchboard. The cords plugged into lines throughout the building bore mute witness to her efforts to spread the alarm, while a window a few feet away provided a means of escape, had she preferred to take it. The usual award of the phone company for valiant action was used to erect a fitting memorial. Gerald Mahaffey, Walton Turner, Benjamin Spaeth, James Roonanâ€”these are names of other telephone employes on the Cleveland Clinic roll of honor. Dampened handkerchiefs over mouths and noses, they went again and again into the building, carrying out victims and keeping up communication service from the switchboard. Saticoy, Calif., was in the path of a wall of water sweeping down from the bursting St. Francis Dam. Mrs. Althea Marks, warned of the disaster, stayed at her switchboard calling residents of the threatened Santa Clara valley, sending messengers to those she could not reach by phone. After the flood had subsided, she continued for three days and two nights without respite to direct the relief workers in the stricken area. In the same disaster a lineman swam through the flood, a line end tied around his waist, to reestablish a broken circuit. Another worked on for hours although he knew his own home and family were in the danger area, and might have been swept away. The Bell Telephone company recognizes heroic acts of individual employes by giving gold, silver, or bronze medals and cash awards from the Theodore N. Vail memorial fund, but when southern California was rocked by earthquakes in 1933, practically all employes in the area performed outstanding service, and a group award of a special plaque was made. Typical of the spirit shown was an incident in an exchange in the center of the disturbance. A call had been sent out for volunteers to aid harrassed operators. Among many others one woman, a former employe, responded and was assigned a station. Some time later the superintendent noticed she was so nervous she could hardly go ahead with the board. He learned she had left her baby ill at home, in the care of its bedfast and helpless grandmother. She was excused. At the Long Beach toll office, a water tank on the roof had been turned over by the first tremor and volumes of water were pouring down through the operating room. A chandelier crashed, narrowly missing some of the operators. Falling debris littered the floor. In the darkened room, with only the switchboard lights to provide illumination, and with hastily thrown up * timbers supporting the walls, the operators worked until finally ordered to leave the building. Major disasters like these sometimes bring the work of the telephone employes to public notice. But day in and day out scattered instances of the same type occur and are recorded only in the company reports. A woman, succumbing to the effects of leaking gas, groped her way to the phone and knocked it over before she collapsed. A telephone patrolman, always on the alert for trouble, cut in on the line to learn why the receiver was off. Turning in a powerful set of batteries, he amplified the sound on the open line until the labored breathing of the woman became clearly audible. Minutes later a repair man, with the help of a neighbor, broke into the house and rescued the woman. Some-times it is the operator who senses trouble. Alarmed by a woman’s weak voice and her failure to hang up the receiver, an operator had the test board man cut in with the “howler tone,” a gradually increasing sound that calls the subscriber’s attention to the fact that the line is open. Getting no response, she called a doctor, who arrived in time to save the woman, suffering from an overdose of medicine. The work of telephone linemen and repairmen, in spite of safeguards, is not always safe. High-voltage lines near by are an ever-present hazard. One repairman was inspecting overhead cables when the cable car in which he was riding came into contact with a trolley wire. A fellow workman, on the ground nearly fifty feet away, heard his cry in time to run beneath and catch the man as he fell, saving him from possible death. Another lineman, encumbered with a heavy tool box and climbers, fell into a flood-swollen river. His companion jumped from a twenty-foot trestle, brought the victim to the surface and fought his way through floating debris to the river bank but, with his helpless burden, he was unable to reach firm ground. Climbing on the submerged branches of a tree, he hauled the unconscious man out of the water, cast off the equipment and swam with him to where some logs had lodged against a tree. There he applied artificial respiration, restoring the man to consciousness, and together they made the shore. All linemen are trained in the principles of first aid and artificial respiration, and many times this knowledge has been used to save lives. And not always is it a fellow workman who benefits. In Boston, James Geagan was laying conduit near a drawbridge under which a diver was working. Hearing cries for help, Geagan ran to the water and found that the boat from which the diver had been working was attached to the underspan of the bridge and had been lifted up when the bridge raised, spilling the diver’s assistants, air pump and equipment into the water. Geagan jumped in, found the lines attached to the diver, and pulled him to the surface. At that moment, the ropes holding the boat suspended broke and the boat, in falling, struck Geagan’s outstretched hands, knocking the lines loose. The diver began to sink again and to make matters worse, one of the assistants, still struggling in the water, accidentally kicked and broke the window of the diver’s helmet, sinking him like a plummet. Geagan climbed to some piling and dived, but failed to locate the lines. Once more he dived and when almost exhausted, he found the diver, brought him to the surface, swam to a raft, and there helped to pull the unconscious man out of the water. Although dizzy and bleeding from the nose, he alternated with a fellow employe for nearly an hour in applying artificial respiration before the diver regained consciousness. It is not heroism alone that is recognized with a Vail award. Hazel Haase, chief op-Clinton, Ind., learned that five Lad robbed a bank in her town making their escape in an automobile with the police in pursuit. She no-county sheriff and the authorities towns in the direction taken by the Bandits’ car. Then she broadcast a description of the car to citizens of the countryside/and requested them to keep her informed of the bandits’ movements. Though the bandits commandeered other cars and frequently changed their course, she immediately relayed such information to the authorities. After a pursuit of more than fifty miles they were surrounded, three of them killed, two captured and the loot was recovered. Thus the story unfolds daily of these modern Paul Reveres whose voices travel the countryside to warn of impending danger or to bring help where needed. Like modern Horatios, the telephone men and women stick to their posts with fire, crumbling walls, or rising water about them and count it all part of the day’s work. “Employee” was borrowed from French in the 19th century. For a long time, English-speaking people still used the French distinctions of “employÃ©” (masculine) and “employÃ©e” (feminine). Following French and English conventions, one would use the masculine form of the word to refer to both male and female employees. Sometime in the late 19th or early 20th century, someone finally decided to regularize the English spelling with the common English pronunciation. 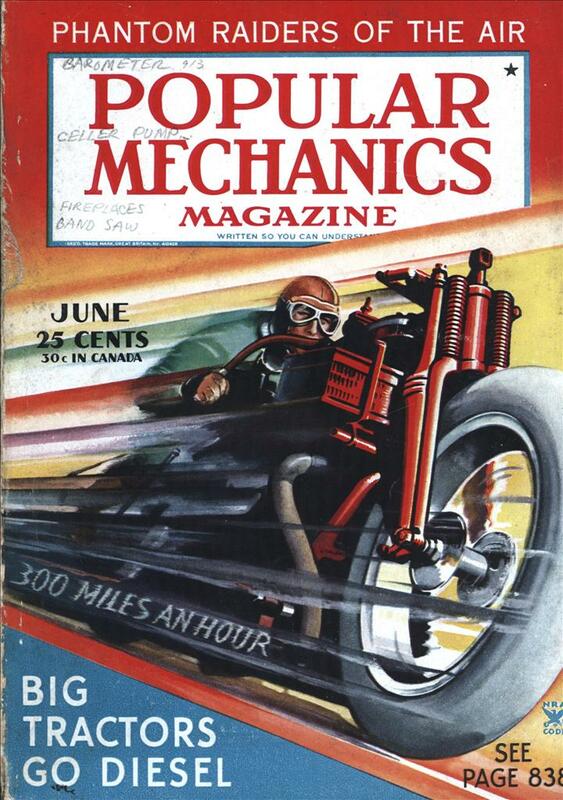 My 1925 edition of H.W. Fowler’s “Modern English Usage” still regards the spelling “employee” as an American innovation, but Fowler does recommend the modern spelling as being more sensible for business use. The acute accent took longer to go. I think I remember seeing the accent on “employÃ©e” on material printed as late as the 1970s. Thanks for the the info Jerry!